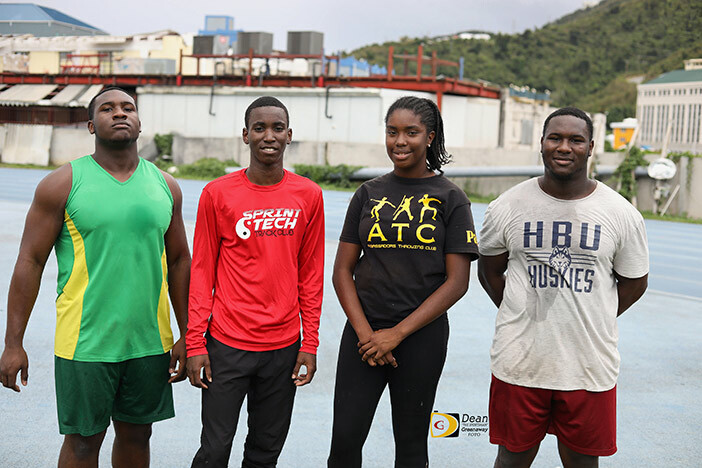 The 2019 Dag Samuels Development Series kicked off Saturday with four athletes qualifying for the April 20-22 Carifta Games in the Cayman Islands. Diamante Gumbs set the pace when he heaved the U20 Boys Shot Put out to 16.80 meters. Just after his throw landed, Jaleel Croal ran a 100m personal best of 10.99 seconds to book his ticket in the U17 Boys Division. Across the field in the Discus, Djimon joined his twin brother when he heaved the platter, 53.10 meters, which he later improved to 54.10. Diamante added his second Carifta event when he hurled the disc out to 52.39m. In the same event, Palesa Caesar punched her first trip to the games when she hurled the implement 34.90m. Qualify in both events, Diamante said, means that he has put in a lot of work and he has a lot of work to do, including strength training and technique work. “Once I get the two of those down pact with big faith and hard work, I feel like I’m going to make it far,” he stated, adding it’s good to have his brother Djimon on the team as it serves as motivation for each other. Djimon said they worked hard in the off season, the results are showing, but obviously have more work to do. He’s content with his performance and qualifying for Carifta. Caesar said she was surprised with her 34.90m measurement. Croal who will be 16 this year, is just the third BVI male athlete besides Derwin Scatliffe in 1987 and Rikkoi Brathwaite to be a Carifta Games 100m finalist, after placing fifth last year. At the Collegiate level, Findlay Jr. Eldred Henry opened his season with a meet record that also broke the 2012 school record and Great Midwest Athletic Conference record, with an effort of 19.44m in the Shot Put.